Amnesia Lemon is a great combination of two lovely cannabis strains. These two cannabis strains are both citrus zesty lemon types with Amnesia Haze being slightly more woody and oak like. The Original Lemon Skunk was the creation of an isolated Skunk #1 pheno that displayed a distinct Lemon Taste and smell whilst Amnesia Haze is a combination of Neviles Haze and Super Silver Haze to our understanding. The genetics in this one have come from near every corner of the world but mostly from the Sativa regions of Southern Asia and Jamaica. Amnesia Lemon has in our opinion a much improved growing structure than the original Amnesia Haze. Plants are shorter and faster flowering with better yields possible in the right environment. The plants now finish around 100cm depending on temperatures and other elements with the plants being more resilient and user friendly for the less advanced. 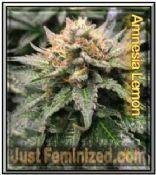 For a Sativa Dominant cannabis Strain Amnesia Lemon grows quite easily with plants responding well to super cropping and other multiple branch growing methods. Amnesia Lemon packs a nice indica punch and will give you a nice cerebral, energetic and slightly psychotic high. If you want crazy dreams and lots of imagination then this strain can certainly be a good choice. All our cannabis seeds are 99.5% female and 99.5% viable! Our K2 seeds are kept in a commercial fridge at optimal temperatures and all packs are dated so we know they are still fresh. Our supplier for K2 marijuana seeds is very reputable and the cannabis strains are comparable with the top major world seed banks but at much lower prices.